Alice in Wonderland inspired. Black outer edge for more contrast against a green core with an orange inner circle around the pupil. Coloured contact lenses inspired by the Mad Hatter character from Alice in Wonderland tale. 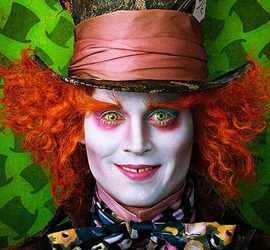 ColourVue Crazy Mad Hatter contacts feature a dark outer edge and a green area around the pupil with an inner orange circle. They can be used not only for Mad Hatter costume but for many others too and if you like to distinguish yourself from the crowd, you can even wear them on a daily basis.